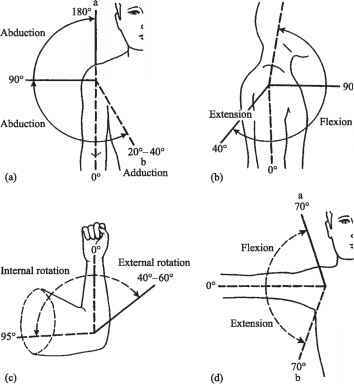 For each point along the contour, the gradient along the normal to the contour at that point is calculated. 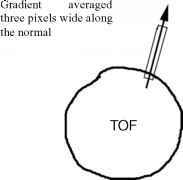 The TOF image is Wiener filtered to remove noise before gradient calculation. The actual gradient used is calculated as an average in a small (3 pixel) neighborhood of the normal. The gradient calculation extends 2 pixels into the lumen and 5-6 pixels outside the lumen (Fig. 8.26). This extent seems to cover most dark rims and also provide enough coverage to distinguish between a rim and a dark region next to the lumen. Figure 8.26: Feature vector calculation: Gradient along the normal to the TOF lumen contour and ratio of local curvature to global curvature on the registered BB lumen contour.